This is the first Living Love Revolution Aphrodite Temple of 2013 there will be at least 3 maybe 4. Available to 16-20 people, no catering, shared food and shared accommodations. Held in Bonny Slope near Portland, OR at Venus Asteria Temple and White Oak Retreat Center. Value of event is $150 min cost $50 cash and gift economy trade. Close friends of Living Love Revolution and their invited guests only. That kind of Listening. We will listen ourselves & each other , see how we are before moving into nesting. How do we hold each other in our desire for self expression tempered by the need to create safety for all present. How to create a home inside our own core that is big enough to hold all our wanting and also extend outward to not only our human companions but the four leggeds the winged ones and all the invisible realms. 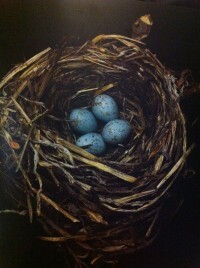 Let us build nests together and hold each other and move toward an EcoSomatic understanding of how to be. An important part of the Consort practice taught recently by Reginald Ray of the Darma Ocean lineage of Chogyam Trungpa Rinpoche is full body gentle holding of the beloved: spooning. We will practice this simple ancient Tantric art and use it to seal the goodness and healing of our experiences together into our cellular memory. Expect to cry, rage, sweat, breathe deeply, pant, dance, greive, laugh, shout and otherwise be fully present.